Offering a comfortable place to stay, Hotel Varmahlið welcomes guests from far and wide into its warm and friendly ambiance. Located in Northwest Iceland, on Route 1 in Varmahlið, the Hotel gives guests easy access to all that this beautiful area has to offer from visiting museums to great sporting activities. Hotel Varmahlið is the ideal base for discovering Varmahlið - Iceland as not only will you get a nice place to come back to at the end of each day, but the hotel staff are always available to help you out with your tourist and accommodation needs. 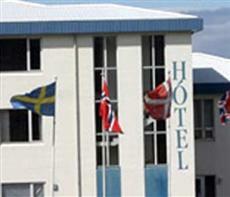 The hotel also has a restaurant serving traditional Icelandic cuisine from an a la carte menu. Hotel Varmahlið is part of The Food Chest Skagafjorður project guaranteeing you local, fresh food from the Skagafjordur region. Please note that between September and May guests are advised to make dinner reservations when checking in at the hotel. Wireless internet access is available in all public areas of Hotel Varmahlið.